Louisville, CO– April 16, 2013 - The EchoStream EN6080 Area Control Gateway (ACG) from Inovonics was recognized at the Security Industry Association’s 2013 New Product Showcase (NPS), receiving honorable mention for the Intrusion Detection and Prevention Solutions Wireless Award at the NPS awards ceremony at ISC West on Wednesday. The newly launched EN6080 ACG is the industry’s first PSIA compliant device that provides IP-based interoperability of leading access control, video and area control (formerly burglary and intrusion detection) systems. 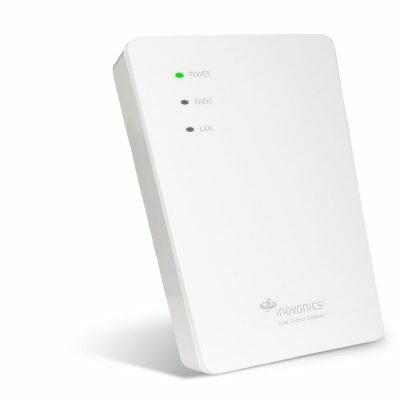 Through common data flow and sharing between access control, wireless intrusion, video and associated analytics, the EN6080 provides a centralized view of facilities and systems, while a web-browser user interface streamlines management across all wireless connection points (up to 3,000 endpoints). With the reliability of an embedded software-based controller, adding Inovonics’ burglary and intrusion detection capabilities to any PSIA compliant application is simplified. Since its inception in 1979, the NPS has been the security industry’s premier awards-based marketing program. This year’s NPS Program had 84 entries from 66 companies. In addition to the Best New Product and Judges’ Choice honors, awards were presented in 20 other product and service categories. NPS judges also presented seven honorable mention awards. The Security Industry Association is the leading trade association for electronic and physical security solution providers. SIA protects and advances its members' interests by advocating pro-industry policies and legislation at the federal and state levels; creating open industry standards that enable integration; advancing industry professionalism through education and training; opening global market opportunities; and fostering collaboration with other like-minded organizations. As a proud sponsor of ISC Expos and Conferences, and owner of the Securing New Ground Conference, SIA ensures its members have access to top-level buyers and influencers, as well as unparalleled learning and networking opportunities. Inovonics is the industry leader in high-performance wireless sensor networks for commercial and life safety applications. Founded in 1986, the company pioneered and patented the use of 900 MHz wireless technology to deliver the most reliable, cost-effective and flexible solutions for critical wireless applications. A leader in security and senior care markets, and the standard for multi-family submetering solutions, the Inovonics family of transmitters, receivers and control modules provides the wireless backbone for many of the world’s most widely used wireless systems. Renowned for exceptional performance and reliability, more than 10 million Inovonics wireless devices have been deployed in the most challenging of commercial environments, where structural limitations and multiple wireless networks can prove disruptive to lower quality systems. Working with leading OEMs and service provider partners, Inovonics provides network design and system engineering support to continuously advance the use of wireless technologies for corporate, industrial, government and educational applications.